Discussion in 'In the News' started by xcel, Nov 17, 2017. 500-miles range, 0 to 60 in 20 sec. at 80k lb GVW, 5% grades at 65 mph at GVW, and fuel costs can be lot less. Tesla Facility in Los Angles, California – The Tesla Semi was revealed to a throng of Tesla enthusiasts and is said to deliver a better and safer driving experience for drivers while significantly reducing the cost of cargo delivery. The Tesla Semi achieves 0-60 mph in five seconds unloaded compared to 15 seconds for a standard turbo diesel semi. The Tesla Semi achieves 0-60 mph in 20 seconds with a full trailer and 80,000-pound GVW compared to a turbo diesel semi of about 45 seconds. When equipped with the Tesla aero trailer. The Tesla Semi climbs 5 percent grades at a steady 65 mph compared to a turbo diesel semi that maxes out at 35 mph on the same 5 percent grade. A 13L Turbo Diesel with 75 to 80k load anyway. The Tesla Semi when equipped with the Tesla aero trailer anyway. The Tesla Semi with its 100 kWh + onboard battery storage provides up to 500 miles of range when equipped with the Tesla aero trailer. The Tesla Semi requires no shifting or clutching for smooth acceleration and deceleration, and its regenerative braking recovers 98 percent of kinetic energy to the battery, giving it a basically infinite brake life. Overall, the Semi is more responsive, and may cover more miles than a diesel truck in the same amount of time including the flat to 80 percent charge time of 30-minutes from some yet to be announced Level4 -- is there even a 4-kWh charger? -- DC Mega Charger. The Tesla Semi’s cabin is designed specifically around the driver, featuring unobstructed stairs for easier entry and exit, full standing room inside, and a centered driver position for optimal visibility. Two touchscreen displays positioned symmetrically on both sides of the driver provide easy access to navigation, blind spot monitoring and electronic data logging. Built-in connectivity integrates directly with a fleet’s management system to support routing and scheduling, and remote monitoring. Diesel trucks today currently require several third-party devices for similar functionality. A new ultra-high current and voltage high-speed DC charging solution will add about 400 miles in 30 minutes and can be installed at origin or destination points along heavily trafficked routes, enabling recharging during loading, unloading, and driver breaks. Cost for a full 4kV Level4 Charger install is TBD and TBA. The all-electric Tesla Semi is designed to have a higher safety standard than any other heavy-duty truck on the market, with a reinforced battery that shields the Semi from impact and gives it an exceptionally low center of gravity. Its windshield is made of impact resistant glass. Jackknifing is prevented due to the Semi's onboard sensors that detect instability and react with positive or negative torque to each wheel while independently actuating all brakes. The surround cameras aid object detection and minimize blind spots, automatically alerting the driver to safety hazards and obstacles. With Enhanced Autopilot, the Tesla Semi features Automatic Emergency Braking, Automatic Lane Keeping, Lane Departure Warning, and event recording. The Tesla Semi can also travel in a convoy, where one or several Semi trucks will be able to autonomously follow a lead Semi. <-- Wow! The biggest immediate cost-advantage comes from savings in energy costs: fully loaded, the Tesla Semi consumes less than 2 kWh of energy per mile and is capable of 500 miles of range at GVW and highway speed, accommodating a wide range of shipping applications given that nearly 80 percent of freight in the U.S. is moved less than 250 miles. Coupled with the low and stable nature of electricity prices – which average $0.12/kWh in the U.S. and can be significantly less for commercial and industrial users, falling to almost nothing when combined with local solar generation and storage – owners can expect to gain $200,000 or more in savings over a million miles based on fuel costs alone. As with all Tesla products, any claims about low TCO have to be taken with a grain of salt. A 1,000 kWh pack costs an estimated $75,000 to $125,000 all by it lonesome. A modern day turbo diesel-powered day cab semi costs about $100,000 with warranty as driven off the lot by comparison. Here are some of back of the envelope calculations on the Tesla Semi pack size and weight. According to Tesla, the Semi will incorporate the Model3's 2170 cells that are approximately 30 percent more energy dense than the current P100Ds 18650s. Considering a P100Ds package of cells weigh 1,330 lbs for 102 kWh total capacity and the resultant energy density increase, the Semi's ~ 1,000 kWh pack should weigh approximately 9,300 lbs. I do not have any confidence on trying to "guess" the weight of the Tesla Semi motors just yet but it will be significant. By comparison, a new Cummins 15X with its emissions pkg., radiator, an Eaton automated manual 10-speed transmission, and 200 gallons of diesel fuel including the tanks come in at approximately 5,500 lbs. In other words, I suspect an 80K GVWR will see the Tesla Semi's max cargo weight fall by about 7,500 lbs. vs. a similarly equipped Day Cab Big Rig due mainly to the most energy dense 1,000 kWh battery pack in history will still fall far short of the energy density of diesel fuel. Both J. B Hunt and Wal-Mart stated they have pre-ordered at least 15 of the unique Tesla Semis. "It's not like any truck that you've ever driven." Reservations for the Tesla Semi can be made for $5,000 USD per truck. Production is scheduled to begin in 2019. Maybe, just maybe this will finally start to produce a profit for the beleaguered but admired all-electric vehicle company. BillLin and TheFordFamily like this. Not much of a sleeper area. Not Designed for over the road driving? Definitely a mini-sleeper. Regional at most. But I love the claimed performance - even though I actually like working the stick, I do a lot of travel in the Appalachians and mountains cost money, both in fuel and time. 500 mile range is acceptable, also points to more of a local/regional configuration. Since we have federal hours of service mandates dictating 10 hour breaks, it's conceivable that on stable routes (such as dedicated service accounts) this would be great. On less stable routes, provided the infrastructure is implemented, the claimed 30 min charge is important since 30min breaks are also mandated. I'll believe it when I see it, but there's potential here. I added some more pieces to the puzzle that have been bothering me since the intro in LA the other night. Here are some of back of the envelope calculations on the Tesla Semi pack size and weight. According to Tesla, the Semi will incorporate the Model3's 2170 cells that are approximately 30 percent more energy dense than the current P100Ds 18650s. Considering a P100Ds package of cells weigh 1,330 lbs for 102 kWh total capacity and the resultant energy density increase, the Semi's ~ 1,000 kWh pack should weigh approximately 9,300 lbs. A WAG on mut part but I am probably +/- 10 percent. I do not have any confidence on trying to "guess" the weight of the Tesla Semi motors just yet but it will be significant. BillLin, Jay and wxman like this. I suspect the weight of the pack will be lower, the 2170s have less casings too. There also should be less supporting material (the exterior case) per kWh too since they're in two big boxes vs if scaled it would be about 10 cases. The Model 3 motors it's using are smaller than even the Model S small motors and they don't have differentials or any but likely reduction gears. I am not so sure as they are using the 3s packs laid out in a different more massively parallel arrangement with possibly much larger cooling needs and channels. It is going to be hard to overcome that estimated 7,500 lbs of additional weight as that comes directly off the trailers cargo weight. Li-Ion's energy density vs. Diesel is multiple orders of magnitude less while the entire drive train including the 10-speed AT was accounted for in my calculations above. The semi is well beyond Tesla fanboy territory and will have to make its presence known on the TCO as a business vase, something the Tesla Corporation has never been able to justify before. TCO is everything here but it would be great to see these as mules at the Long Beach Port instead of the FCVs and CNG trucks intermixed with the diesels that are there now. wxman, Jay and BillLin like this. 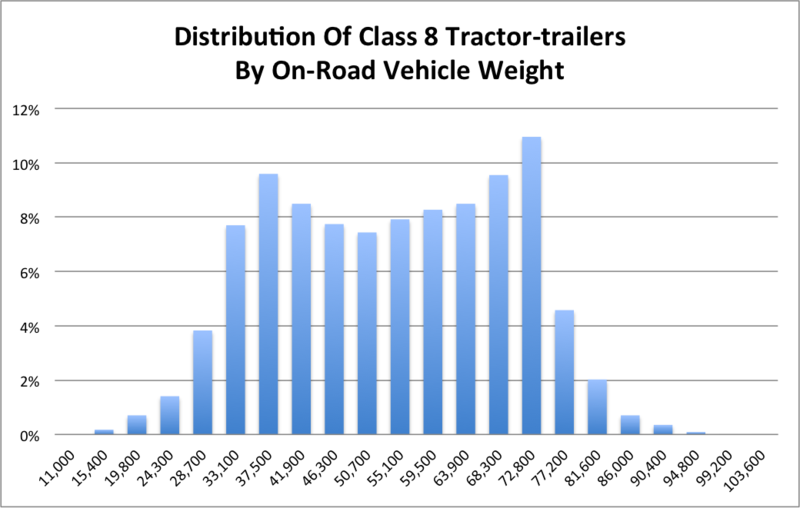 How often are trailers loaded up to a point where that ~7500 pound weight difference will be important? The economics will look a little better up here compared to the USA, our electricity prices are lower and diesel prices are higher. Probably why Wal-Mart is planning to use most of its first order on its Canadian routes. ...The semi is well beyond Tesla fanboy territory and will have to make its presence known on the TCO as a business vase, something the Tesla Corporation has never been able to justify before. TCO is everything here but it would be great to see these as mules at the Long Beach Port instead of the FCVs and CNG trucks intermixed with the diesels that are there now. These are my thoughts as well. If I were a trucker, I'd be looking at CNG as an alternate fuel. There's already some infrastructure in place for it and the payoff is almost immediate. This BEV truck is not only saddled with heavy batteries that markedly reduce payload, and range limitations that a conventional truck won't have, but it will be out of service for hours longer than a conventional truck to recharge. A car buyer might go for the panache or novelty of a BEV but most truckers are hard businessmen and I don't think they will be able to make the math work. In fact, I think the main purpose of the truck for Tesla is to make a big media splash so they can issue more stock to investors. That seems to be the company's modus operandi. They are a cash-burning business that depends on new investors and new depositors to stay in business. As often as possible. I would think they would be better off making a truck for local/city/suburban deliveries. There's a little start-up venture that might use them. They're called UPS. Then there's still that pesky TCO issue. But the fat torque would be well-suited for the typical UPS leadfoot driver. Which makes you wonder why Tesla doesn't first come out with a UPS/Fedex large delivery van .... you know ... the ones that drive less than 200 miles/day, waste a lot of fuel idling, and return back to the same hub (recharge station). Wouldn't that be the logical next step if you really wanted to sell "electric trucks" in volume and make money?? Or is the primary goal just to "stay dreamy"? BillLin, xcel and Jay like this. There are plenty of applications where such long range isn't needed. Replacing trucks on regional and local routes will have a bigger impact on fuel use and emissions. Long haul trucks spend most of the time cruising at steady speeds on a highway. As the route distances get shorter, the trucks will likely run into more stops, turns, and see use with municipal areas. Electrics won't suffer the efficiency loss of an ICE in such conditions while improving local air quality. As you mention, there is some CNG infrastructure in place, but in many cases the fleet operator still needs to install their own refueling sites. A CNG refill could also take as much time as a fast charge for a BEV. So it and the BEV aren't going to be an option for an individual trucker at this point. With a covered trailer, truck loads also have to deal with the cargo's bulk. The data came from Oak Ridge National Laboratory. The 7500# reduction isn't going to hurt potential sales of this Tesla much. It won't be hauling lead or gold ignots, but there is plenty of other stuff that needs to be shipped. Mercedes is doing an electric box truck. They still might have a partnership going with Tesla. BillLin, seftonm, xcel and 1 other person like this. And if they do have some agreement , they may not want to compete directly or indirectly with the popular Mercedes Sprinter. Trollbait, BillLin and xcel like this. I can't speak for all carriers, but ~8 out of 10 loads I haul would be fine losing 7500lbs carrying capacity. Nearer the weight limit though, I wonder where it'll carry a lot of that weight and if it will affect keeping the axle weights legal. Holding 65MPH on 5% grades is a big deal. Coordinated convoys is a big deal. 25¢ / mile savings is a big deal. I don't feel the need to hold 65MPH uphill. Most of the truckers I've seen on the highway do use DWL , even if they don't call it that. I'm not sure that Elon can pull this one off. It's improbable with our current technology. Forget the Boring , and focus on making ( and selling) the Model 3 profitably. Do I sound like a shareholder ? I do like the idea of coordinated convoys , but around here we have our own coordinated convoys on entrance ramps , 7 feet apart at 60 MPH , all trying/hoping/bullying their way onto the highway. a longer interval then. Just like I do when coming to an interchange , he says smugly. I was speaking with a truck driver yesterday and mentioned most trailers are not the full aero variety. He guessed there would be a 10 percent fall off in efficiency/range while running a std. trailer behind the Tesla Semi. I see a lot of negatives popping up about width of the cab and trailer, the cargo cap, and cost. Tentative pricing information is out, $150k for a 300 mile version, and $180k for a 500 mile version. 1. Center driver's seat has got to go. Visibility is bad enough without having to have our good visibility side compromised. 2. A legal issue: fed guidelines state we have to log fueling time as on-duty time. Since electric charging really doesn't need to be attended, would it be legal to take a 30-min driving break while charging? 3. When you're paid by the mile, you'll feel the need to hold speed uphill. Trust me. To the extent there's DWL, either it's terrain-sensing CC as I have (quite effective), or experience knowing when to back off before cresting so as not to gather too much speed on the descent and risk burning up brakes or hitting a curve with too much speed, not good to brake these in a curve...up the regen braking and that would be interesting. Early reports is that it is now dead. Really?! That doesn't make sense. The recent information was the 500 mile model was actually closer to 600.